In recent weeks creator Mike Mignola has talked about ending Hellboy as we know it. 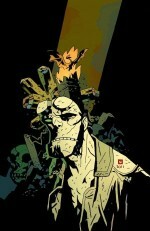 The character will continue in some form or another with Mignola returning to his role as the character’s writer/artist, and with standalone flashback stories and graphic novels. While characters in the Marvel and DC universes regularly die and come back relatively quickly, Mignola is well known for killing characters and keeping them dead. This issue from Mignola and Duncan Fegredo wraps up several years worth of stories, and will undoubtedly be the end of and era for the book. 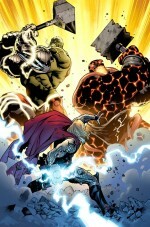 Fans of big comics action will be interested in picking up this latest issue from Marvel’s big summer event. Matt Fraction and Stuart Immonen promise a big throwdown between Thor, and the Worthy versions of Thing and Hulk. Plus there are some dramatic changes for some of Marvel’s other big characters, all leading up to this book’s final issues. Mike Mignola kicks off the second miniseries featuring his scarred vampire hunter. 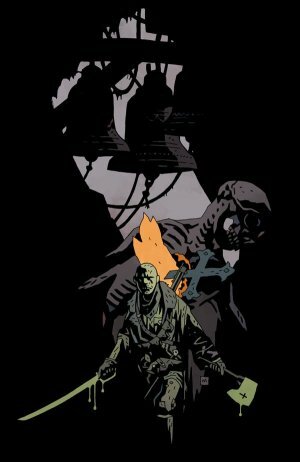 Alongside first series’ collaborators Christopher Golden and Ben Stenbeck, Mignola continues his tale of Lord Baltimore on his quest for vengeance. This is a dark, moody, horror tale that’s much closer to Bram Stoker’s original Dracula story than almost anything else you’ll find these days. 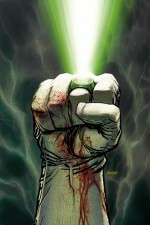 This epilogue to the popular War of the Green Lanterns story sets up the next year’s worth of GL tales. Not only have we been introduced to Earth’s new Green Lantern, but this series gives us an idea to how the GL Corps will start reacting to the new GL’s shocking identity. Also be sure to pick up this week’s issue and support local comics artist Andy Smith, who contributes art to both this book and this week’s Flashpoint: Frankenstein and the Creatures of the Unknown #3. > Bonus Picks of the Week: Amazing Spider-man #667, Blankets HC (new edition), Terry Moore’s Echo Complete Edition SC, Ultimate Fallout #5, and DC Retroactive: The ’80’s: Green Lantern, Justice League America, and Superman. Great write-up, Seth. All of these look like must-have issues. What about the end of Snyder’s run on Detective in #881 that releases today, though? That is the one that I am most looking forward to. You’re right, Brandon, that’s also a top pick. I definitely plan on spotlighting some of Snyder’s upcoming DC books. ← REMINDER: V FOR VENDETTA DISCUSSION GROUP!